Don't be negative, be positive! Hull really is a great city. Because of two comments in my local newspaper, the Hull Daily Mail, I decided (again) that it was time to dust off the word-processor. I put some rock music on the radio, sat down with a pile of digestive biscuits and a cup of tea, and thought about positivity. Hull is a great city. It’s got so much going for it. We have art (and famous artists), music (and famous musicians), museums, and a rich, rich history with many famous sons and daughters. Why then do many people in Hull have such a negative outlook? 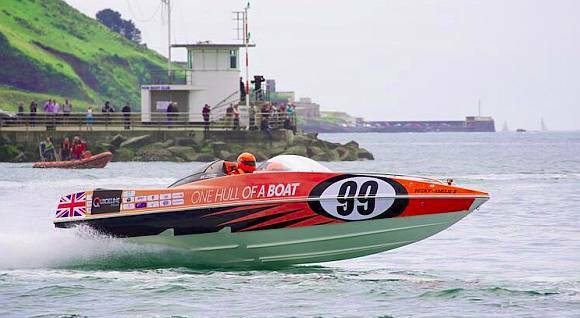 I’ve commented before on the “One Hull of a Boat” P1 Powerboat project, and on the 29th and 30th of June our boat was in Plymouth for round two of the 2013 P1-Powerboat Championship. If you read my previous article you’ll recall that it’s only been a few months since our driver and navigator gave up their rubber ducks and the little dinghy on the pond, and sat in a P1 powerboat for the first time. Plymouth was a great success for “One Hull of a Boat”, and we finished seventh and fifth, with an overall sixth place for the Plymouth leg. ““Success” in any form of motorsport is finishing without writing off your vehicle. Often points are awarded down to last place, and if you get the right circumstances a vehicle can be consistently 3rd, 4th, 5th or whatever, and still ‘win’ a season or tournament. With a P1 powerboat you’re slamming the hull into water at 60-80mph, many times a second. The 250hp motor is running at full bore in a terribly violent, hostile environment (with no gearbox either). At 80mph, water is hard. Very hard. To finish at all in this environment is, most definitely, a success. The success of “OneHullOfABoat” is not only measured by the races it finishes. It has raised the profile of Hull across the world (truly) and generated massive interest in the city. Anyone can join in and help to sponsor the boat, and many many businesses and individuals who believe in the power of positive publicity to change things have done so. The only thing holding Hull back is the cynicism, nihilism and negativity of it’s inhabitants. 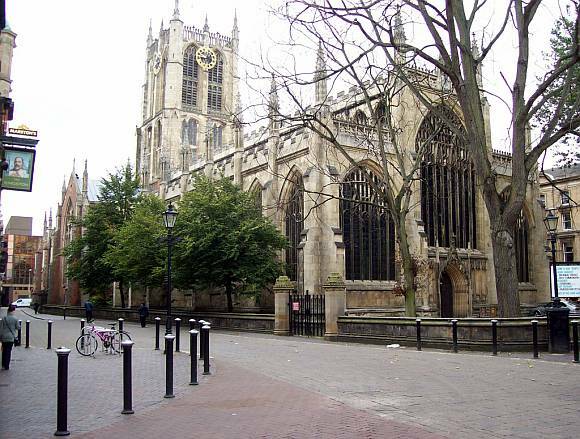 Visitors love the place, as do many who have come to live in Hull from all over our country. Our city is on the map. We need to make sure it stays there. 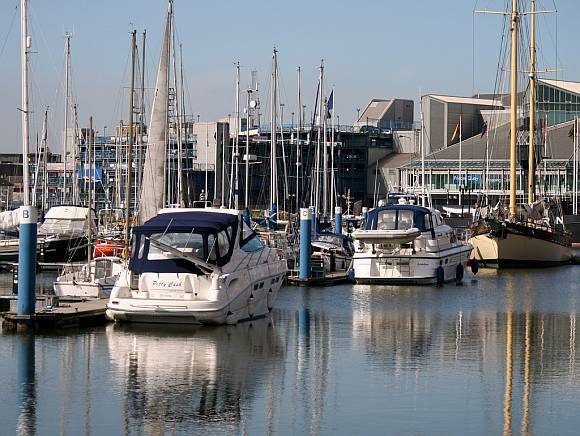 Hull Marina. Princes Quay Shopping Centre, rear right. Hull has been in depression since the fishing industry died in the mid 1970s. There are many reasons for this, but I think the reason that matters is that the average person from Hull sees nothing to be proud of; nobody is giving Hull a hand up after our fall. Why do we need to wait for others to help us? The people of Hull are traditionally a strong and proud group, not people to be easily cowed. During world-war two Hull was pounded by German bombers from 1941 to 1945. Half of the 330,000 population were rendered homeless. Out of 93,000 homes, only 6,000 escaped damage or destruction. With our history of overcoming adversity like that I don’t know why, or when, we went from being survivors to victims. It’s time for a change. It’s time for Hull to once more take centre stage, to reclaim the spirit that is part of our heritage. Holy Trinity Church, Market Square, Hull town centre. The future of Hull is in our hands. It’s what we do that matters, not how loudly we complain about what other do (or don’t do). There’s no reason we can’t take the opportunity that the City of Culture bid has given us and try to turn the 30+ year depression that Hull has been in around. We’ve nothing to lose, and everything to gain. It’s time for everyone to roll up their sleeves and do whatever they can to support and improve our glorious city. It doesn’t matter if you’ve money, it doesn’t matter if you’re broke – everyone can do something. Sponsor something. Volunteer for something. Help those less fortunate. Hell, just pick up a can from the street and bin it! Take pride in Hull; take pride in who you are, take pride in where you are. All photographs remain the copyright of the original photographer, and all copyrights and trademarks are acknowledged. Good to see the drum for Hull getting such a good bang! As a Scot living in Teesside I love visiting Hull and look forward to doing so again before too long..